With the arrest of a Pakistani spy, the Special Cell of the Delhi Police today claims to have busted an espionage ring and seized incriminating documents and photographs from his possession. In a sensational incident, armed criminals shot dead a Hindustan Lever employee in busy Nehru Nagar area of Ghaziabad and looted Rs 10 lakh from the counter of the company office. With the arrest of two notorious inter-state criminals, the South-West district police claims to have worked out as many as 50 cases of attempt to murder, dacoity, motor vehicle thefts, snatchings and Arms Act. The police also seized one country-made weapon, one live cartridge, one self-actuated knife, eight stolen vehicles and implements from their possession. A cloud mass warmed up Delhi today as the weather office has predicted light rains for tomorrow. The national Capital recorded a temperature of 8.7 Celsius, two degrees above normal. Noting that mother tongue plays a crucial role in learning, the National Focus Group on Teaching of Indian Languages is hoping to re-establish the importance of Indian languages in school education. With the arrest of three persons the Crime Branch of the Delhi Police claims to have busted a gang involved in stealing iron cable drums belonging to NDPL. The UP government has decided to launch a vigorous state-level campaign to round up the dreaded criminals. The admirers of the late Sikh American Yogi Harbhajan Singh paid tributes to the religious leader credited with bringing Sikhism from India to the West. The mortal remains of Major Amit Rathi of Rashtriya Rifles (RR) were consigned to flames here at the Suraj Kund cremation ground this afternoon with full military honours. The BJP has asked the Delhi Government to scrap the Rs 20 fee, which is being collected by the rationing officer for issuing new ration cards. The disabled rights activists have called for the need to ensure that the disabled receive enough aid and attention during the time of natural calamities. Central team meets migrant Kashmiri Pandits settled in camps in Delhi. The accused person has been identified as Mohammad Azhar Rafiq, resident of Punjab, Pakistan. The accused also possessed an Indian passport in the name of Sarang Ali Khan, resident of Colaba, Mumbai. Acting on a tip-off that a Pakistani spy had entered India for collecting vital information of defence establishments and would be arriving in the Capital from Gwalior by the Kerala Express, the sleuths laid a trap at the New Delhi Railway Station. He was spotted by the police team at around 4.45 pm yesterday. When the suspect was followed, he entered a courier shop and gave a packet to be dispatched to Bangladesh. Immediately, he was nabbed and the packet seized from his possession. When the packet was opened, the sleuths found another packet inside, addressed to one Ghulam Mustafa, Sadiqabad, Pakistan. The packet contained photographs, maps and other documents related to defence installations in India. During interrogation, the accused disclosed that in May 2000, he was contacted by a Pakistani intelligence operative, Ghulam Mustafa, who hired him to work for the Pakistani intelligence. Rafiq was also promised that he would be adequately compensated. Accordingly, Rafiq was sent for two months to Karachi and imparted training in ‘trade craft,’ in recognizing Indian Army, identification of Army uniforms, ranks, divisions and brigades. He was also trained in handling computers including the use of Internet. Again in November 2000, he reached Dhaka with a Bangladeshi visa and met an intelligence operative for his stay in Dhaka. From Dhaka he entered Kolkata and then to Ajmer. From Ajmer he entered Mumbai and got a TV mechanic job in Colaba. From Mumbai he visited Gwalior on several occasions for collecting details about the army installations. Rafiq told the sleuths that he procured his Indian passport from RPO Mumbai after furnishing fake documents. The Delhi Police today arrested a man for selling used stamp papers and recovered papers worth Rs 87,750 from him. Deva Nand Sharma would obtain used stamp papers from a cousin, the police said. He would then allegedly remove the deed contents to resell the documents at half their original price. A decoy deals led to Sharma’s arrest at a Tis Hazari car parking and stamp papers worth Rs 87,750 were seized from his possession, the police claimed. Arun Kumar Sharma was about to deposit Rs 10 lakh in a Bank of Baroda branch in Gandhi Nagar when the motorcycle-borne criminals struck. A profusely bleeding Arun, shot in his stomach, was rushed to Yashoda Hospital where he succumbed to his wounds. In spite of the police checkpoints, the bike-borne assailants could not be traced. The Hindustan Lever agency office of Surinder Kumar Aggarwal is located in M-30 C in a well-populated residential colony, Nehru Nagar. The area also has a Reliance India Mobile agency outlet. Aggarwal said a sum of Rs 10.22 lakh, the sale proceeds of past two days, was put in a bag and the cash was to be deposited in a Bank of Baroda branch in Gandhi Nagar. As Aggarwal was about to leave in his car for the bank, two youngmen astride a Pulser bike came and sprayed gunshots on Arun Kumar Sharma who was sitting on a bike with “Police” written on it. Soon the assailants came in, training their guns on Aggarwal, they took away the money bag from the counter. He got panicked and failed to understand anything. The criminals sped away through narrow streets, leaving the eyewitnesses stunned. SSP, Ghaziabad, J.N. Singh, SP City Umesh Srivastava and CO Chirangiv Sinha and Sihani Gate police, all rushed to the scene. SP City later said that the police are investigating the crime from various angles. Some criminals killed a youth, dumped his body in Sunpura jungle under Rabu Pura police station. The body was found on Sunday. In another case under the Kasna police station, criminals snatched a motorbike and cash from a youth. They threatened to kill him if he reported the matter to the police. Sunpura resident Kishen Lal worked in Tilpata village. He had left Tilpata at 5 pm on Saturday, but did not reach home. The police were informed on Sunday that a body was lying Sunpura jungle. It was identified as that of Kishan Lal of Sunpura. The police did not find any injury mark on his body. Death in accident is also ruled out. The police feel Kishen Lal was strangulated and later his body was dumped in jungle. In the second incident under the Kasna police station area, three criminals had robbed a youth of his bike, cash and gold ring on Amarpur-Nawada Road. The criminals had tried to kill him, but he was able to flee somehow. 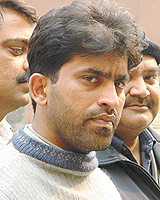 According to police, Rajender Naggar originally of Samstipur village lives in Beta Sector of Greater Noida. He was coming to Greater Noida from Samstipur village at 10 pm when some criminals, who had blocked the road by tying a rope across the Amarpur-Nawada Road, stopped him. He was then robbed of his motorbike and belongings. He was robbed of Rs 700, a gold ring and motorbike by three criminals. Later, they had tried to strangle him, but somehow he was able to free himself and fled. He informed the police, who are trying to nab the criminals. The accused persons have been identified as Tajender Singh, alias Kaka, resident of Moti Nagar and Surender, alias Seru, resident of Uttam Nagar. With a spurt of vehicle theft incidents in Naraina, Vasant Vihar and Delhi Cantonment areas of South-West district the police deployed sources to develop intelligence. Acting on a tip-off that Tajender would be coming with his associate in a stolen motorcycle to commit some crime in the Inderpuri area, the police nabbed them. During interrogation, Tajender disclosed that when he was lodged in Tihar Jail he came into contact with Sanjay Mukerjee, Mahender, Usman, Rajesh Thukari, receiver of stolen vehicles in Nepal, Sukhwant Singh, alias Babla and Virender Singh, alias Jyoti and learnt the tricks of auto-lifting. On his release, he got four vehicles financed from Satish Dahiya and sold the vehicles to one Bhupinder Singh Soni, alias Soni, resident of Jalandhar, after making fake documents. He also visited Nepal and met criminals Awadesh Kumar, alias Rinku and Surender, who were dealing in fake currency. The day was relatively warm because of heat-trapping cloud cover, the weather office said. Light rains or thunder development may occur in parts of the Capital tomorrow, it added. After a day of scattered light drizzle, Delhiites woke up to a cloudy morning today but the minimum temperature remained above normal. Though there was light mist in the early hours, it did not hamper flight operations, airport sources said. There was a marked improvement in railway services too, though three trains continued to remain cancelled. While over 30 trains were running upto 36 hours behind schedule when the northern plains were blinded by fog in the last weeks of December, the list of late-running trains was down to just two today. The minimum temperature today was 8.7 degree Celsius, 1.8 degrees less than yesterday but still two degrees above normal, a Met official said. This group, which began its two-day meeting here in the NCERT today, will prepare a position paper for the ongoing review of National Curriculum Framework, so that Indian languages make an importance in the school education. Prof Ramakant Agnihotri, Chairperson, (Department of Linguistic, University of Delhi), in his opening remarks said that no nation has such wide spectrum of languages as India. This is a golden opportunity for us to bring the Indian languages back on the main stream of school education through this National Curriculum Framework. Speaking on the present status of the Indian languages, he said that all the classes are bilingual and he does not find any monolingual teaching across the country. He further added that language has no regional, social and cultural boundaries. Emphasising the importance of mother tongue, he said, it plays crucial role in learning and our teachers must encourage the practice in teachings. As academicians, we are equally responsible if our children feel ashamed of speaking their mother tongue. He expressed his hopes and said that the group will prepare a position paper to re-establish the importance of Indian languages in school education. It was further pointed out that language is an important bridge between society and man and is a sound medium for other subjects, as it becomes language of teaching. Language is linked with every subject we study, like Geography, History, Biology or Sciences. In order to have good command over any subject, one has to understand the medium of language. With the arrest of three persons the Crime Branch of the Delhi Police claims to have busted a gang involved in stealing iron cable drums belonging to NDPL. The sleuths also recovered 12 such drums worth lakhs of rupees from a godown in Mundka village. 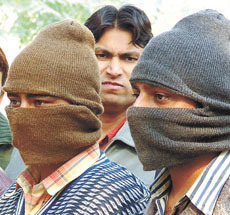 The accused persons have been identified as Mahesh, alias Ravi, Jai Prakash and Babu Jaan. Acting on a tip-off that some persons were involved in stealing iron cable drums, the sleuths raided the godown of Mahesh and recovered as many as 12 drums from his possession. During interrogation, Mahesh told the sleuths that he used to introduce himself as a private contractor working for government agencies like MCD, NDMC, CPWD and NDPL. He also printed visiting cards posing himself as proprietor of one KDR Constructions. As a bonafide contractor, he used to hire cranes and recovery vans for transporting iron cable drums from construction site to his godown in Mundka. Since each of the drum cable weighed about 750 kilograms and worth Rs 30,000, the accused persons used to cut them into small pieces and sold them to private transporters and some kabaries. There are about 76 criminals in the state, each carrying a reward of Rs 20,000 or more on their head. Two among them carry a reward of Rs 2 lakh. Brijesh Singh has Rs 2 lakh and Kallu carries Rs 1 lakh reward on his head. To make this campaign a success, the UP police are contacting the police forces of other states, especially the neighbouring states. The cooperation of Interpol is also being solicited for the success of the campaign. This was stated by R.K. Chaturvedi, SSP, Crime and anti-dacoity wing of UP, who presided over as chief guest at a function in a health clinic in Sector-22 Noida, yesterday. The main task of crime and anti-dacoit cell, Mr Chaturvedi said, was to collect, collate and sift information/data about the crime and provide the local police units with the information and also help them in other ways to nab the notorious dacoits. During the last week, the police had shot dead four top criminals, including Chandan Yadav carrying a reward of Rs 20,000, Ashok of Chandoli carrying a reward of Rs 10,000. The anti-crime and dacoity cell, Lucknow, had provided valuable information to the local police in those campaigns, Mr Chaturvedi said. The Shiromani Akali Dal (SAD) Secretary-General, Mr Sukhdev Singh Dhindsa, the former Rajasthan Governor, Mr Madan Lal Khurana, Punjab MP, Ms Praneet Kaur, Jain religious leader Amrendra Muni and Yogi Shanti Sarup of the Hare Rama Hare Krishna Mission gathered at Gurdwara Bangla Sahib to remember the Yogi who died in October last year. A former customs agent in New Delhi, Yogi Harbhajan had emigrated to the United Stated from India through Canada during the 1970s. He eventually became a Los Angeles Yoga teacher and ultimately formed a religious group known as 3HO—‘The Happy, Holy, Healthy Organisation’. Yoga has no place in Sikhism but the Delhi Sikh Gurdwara Management Committee (DSGMC) hosted the ceremony to honour the late Yogi at the historic Bangla Sahib. The Sikh leaders praised Yogi Harbhajan for promoting Sikhism in the West, as they regretted that the religion was losing its ‘’turbaned identity’’ rapidly in Punjab, the heartland of the faith. He motivated thousands of converts to embrace the 500-year-old faith, trained hundreds of Kundalini Yoga teachers and schooled many followers in his values. Major Rathi of 40 Armoured Regiment sacrificed his life while combating terrorists in an encounter in Balgaon district of J and K last Thursday. Though the army officer died on the spot, his wife and other family members received the information only on Friday around 4 pm. Earlier, the mortal remains of the officer reached the Delhi Air Base at 6 pm on Saturday. The coffin was later brought to the military hospital in Meerut by road the some day and the body was placed in the mortuary. Thousands of people, including some political leaders, paid their last respects. The BJP has asked the Delhi Government to scrap the Rs 20 fee, which is being collected by the rationing officer for issuing new ration cards. The President of the Delhi Pradesh BJP, Dr Harsh Vardhan, claimed that touts were recovering hundreds of rupees from the needy in connivance with the officials of the rationing office. The rationing offices, he said, should be raided and all the touts and officials arrested. Apprehending that the disabled could be left out while the rehabilitation work is on in the tsunami-affected areas, the National Centre for Promotion of Employment for Disabled People (NCPEDP) is sending two representatives to the Andaman and Nicobar Islands to assess the condition and the problems faced by the disabled. “Though it is not done consciously, it is a fact that the disabled people are often neglected after such tragedies. If you see how relief work is carried out, you will understand the problems faced by the disabled. Packets of food and clothes are often dropped from the air and people have to scamper to collect them. How do you expect a disabled person to do the same?” pointed out Javed Abidi, Executive Director, NCPEDP. The two representatives, Rama Chari of the NCPEDP and Rajul Padmanabhan of the Vidya Sagar who are part of the core group, will collect information on the problems, encountered by the handicapped, which will lead to the formulation of an action plan.